As many citizens miss the Town Council and Board of Education meetings, it might be enlightening to share short clips of members as they express their stands on various issues. Expect a new batch of videos soon for 2018. Upcoming on the November ballot is the town's bond request for $19.5 million for a new public safety building on top of the roughly $85 million in debt that Scarborough is already carrying. In the words of Chairman Babine from an April 2017 town council meeting, the citizens voted for the majority of this existing debt, so if anyone is to blame it is the voter. For the context of the above comment check the following link at about 1:05:00 into the meeting. This clip is from the July 19, 2017 Town Council meeting. It is interesting to see how voters who might hold a fiscal concern regarding the significant growth of the budget are painted as being anti-education. Begin at about 03:23:10 for the discussion on a segment of the voters being anti-education. This is Julie Kukenberger, your superintendent. Thank you to those who have already voted. If haven’t voted yet, please plan to vote tomorrow, July 25th at Town Hall in support of our schools. Polls will be open from 7:00 a.m. to 8:00 p.m. Keep in mind that the proposed school budget will create a 2.99% tax increase for residents. Please vote yes and support our community. Begin at about 01:20:50 for the discussion on using school resources for promoting a specific ballot outcome. 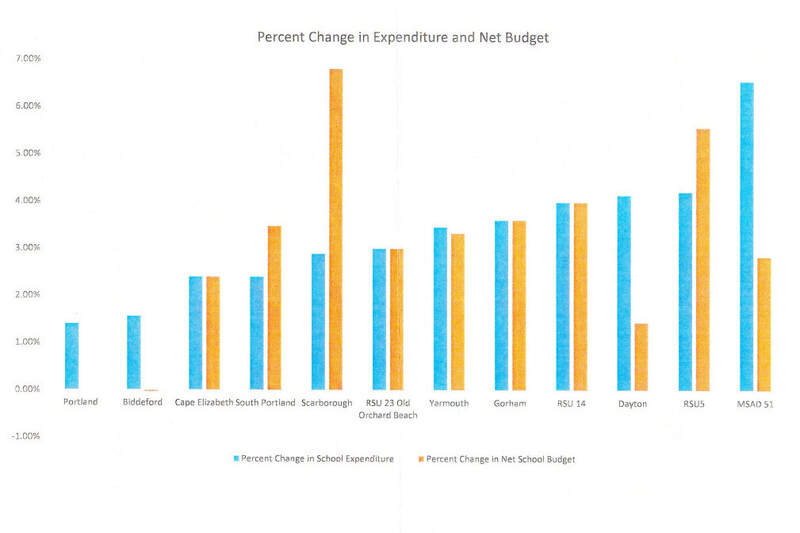 During the July 19 meeting, Councilor Caiazzo shares his opinion that a voter rejection of the school budget will be met by cuts to the budgets of both the school and the municipal segments and that services will be impacted. ​Although we at SMARTaxes strive to share factual charts and data, many within our town leadership do not see value in our efforts. At the June 7, 2017 Town Council meeting prior to the defeat of the first School Budget Referendum, Councilor Donovan voices strong displeasure with SMARTaxes highlighting the 7.4% increase of the taxpayer portion of the school budget apparently believing the only number that should be mentioned is the overall Property Tax increase. The citizens only vote on the school budget, though. Here is a link for the entire June 7 meeting video should you wish to watch any of the more than two hours of discussion leading up to Councilor Donovan's sign criticism. Join the meeting at about 02:13:00 to view the broadcast of the above short segment. At the July 5, 2017 Board of Education meeting, the specific allocation of the $236,000 reduction from the first Budget Referendum was resolved. A considerable amount of frustration was exhibited during this public meeting with the clip below being representative. Below please view the short clip and then take the time to read the content below the 'full meeting video' button. In all fairness if there is any doubt of being taken out of context please view the entire chair member discussion at the Scarborough Town website running from 00:32:05 - 00:37:20 with the below link. All sensible taxpayers want a strong school system. To desire anything else is incredibly short-sighted. Many in this community put a high priority on cost effectiveness and reasonable tax levels. The compounded growth of ongoing significant annual tax increases makes long term residency in this community a challenge for many. Recently, in some Facebook comments a local business owner summarized it well. Years back it required slightly over 100 nights of rentals to cover the annual property taxes. That number is now above 200 nightly rentals. Yes, annually there is often a push-back on the school budget by the community. The only part of the budget that the community directly votes on is the school budget. 68% of the taxpayer dollar goes to the school system. When there is a significant increase in the school portion of the budget coming from the taxpayers, it is felt strongly in the household budget of many of the citizens. Let me share a chart that came from a recent town hall meeting and originates with town officials. No other town on this chart seems to be experiencing the percentage of school system increase that Scarborough is facing. With the current School Budget Referendum (#2) the taxpayer is being asked to contribute 1.3 million dollars more than last year. The State of Maine has reduced their contribution by 1.4 million dollars relative to last year, FY2017. For the coming FY2018 budget, 2.1 million dollars of school 'fund balance' (excess funds from prior year tax dollar overages) is being applied to more than make up for the 1.4 million dollar loss in State of Maine revenue. SMARTaxes wishes to be part of a community solution. The frequent annual budget battle between taxpayers and the town have the school in the middle because that is the only part of the budget that the citizens directly vote upon. The demographics of this town show the average age increasing over time. That fact likely means this problem of annual budget battles is only going to become more evident unless this community works together to resolve it.